Ball® Regular Mouth (12 oz.) 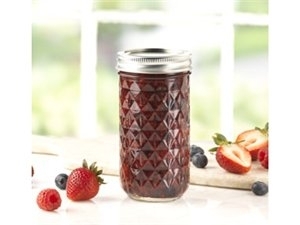 Quilted Crystal Jelly Jars are ideal for fresh preserving recipes such as jams, jellies, sauces, mustards and flavored vinegars. The Quilted Crystal design adds a decorative touch to these multi-purpose jars – also use them for serving, creative décor and gift giving.